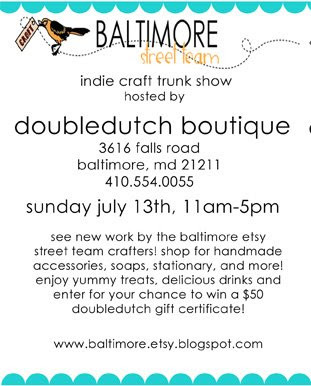 Double Dutch will play host to BEST this coming Sunday, July 13th for our first ever trunk show! There will be yummy eats and delicious drinks, as well as new work from BEST crafters. Stop by between 11am and 5pm, meet BEST members, have a snack, and do some shopping. Also, enter to win a $50 gift certificate to Double Dutch for a future shopping spree! (Winner will be notified via email on July 14th, 2008.) We'll see you there!